A mechanical engineer by education, Sonam has worked in the field of education reform for 27+ years. The man who inspired the popular “Phunsukh Wangdu” character in the Bollywood hit Three Idiots, Sonam has been instrumental in changing the face of education in the mountains. His sessions throw a whole new perspective on innovation and entrepreneurship that embraces social change. In 1988, he founded SECMOL (Students’ Educational and Cultural Movement of Ladakh) that aims to reform the government school system in Ladakh. In 1994 he was instrumental in the launch of Operation New Hope, a triangular collaboration of the government, village communities and the civil society, whose work has been instrumental in improving the pass percentage of 10th graders in the region from a dismal 5% to 75%. For students who still failed in their state exams, he founded the SECMOL Alternative School Campus near Leh, a special school where the admission criterion is failure in exams and not grades. 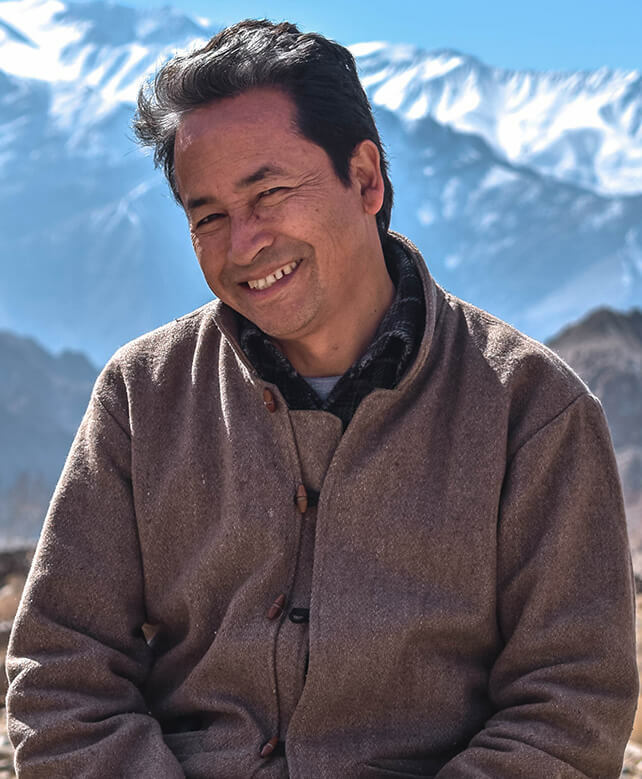 As an engineer, Sonam Wangchuk has been teaching innovation at the SECMOL Alternative School, where together with the students, he designed and built solar heated buildings that are low cost, made of earth/mud but maintain +15 C even when the outside temperature is –15 C in Ladakhi winters. His “Ice Stupa” artificial glacier have claimed fame for helping solve the water crisis in the region due to climate change and fast melting glaciers. The Ice Stupas store water in the winter in the form of giant ice cones or stupas, which melt over summer and provide water to the lands, just in time for irrigation. Sonam is the recipient of several awards, The Rolex Award for Enterprise 2016 in Hollywood USA, The Terra Award 2016 for World’s Best Earth Buildings in Lyon France, The UNESCO Chair for Earth Architecture for India in 2014, ‘Real Heroes’ Award by CNN IBN Channel in 2008, ‘Green Teacher’ Award by Sanctuary Asia Magazine in 2005, Ashoka Fellowship by Ashoka: Innovators for the Public in 2002, ‘Man of the Year’ by The Week magazine in India in 2001 and the Governors Medal by the J&K State Government in 1996.